Today is World Nutella Day, and I applaud the good people who decided that this chocolate and hazelnut wonder deserves a day of it’s own. 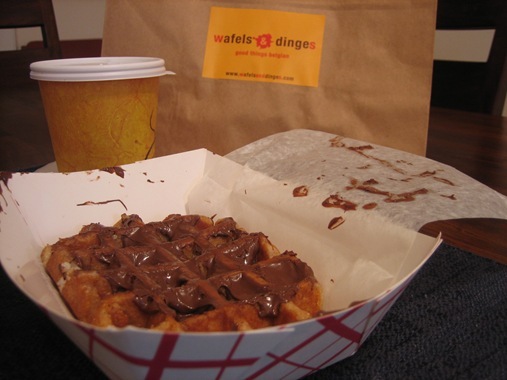 In honor of the occasion, I want to share the nutella drenched waffle pictured above that I had at Wafels & Dinges, a Belgian waffles truck. Yes, that’s right. A truck. Where else but in New York, right? * Yet another reason I love this city – it has trucks motoring around cheap gourmet treats. I first read about them here in the NY Times and was looking forward to trying one ever since. 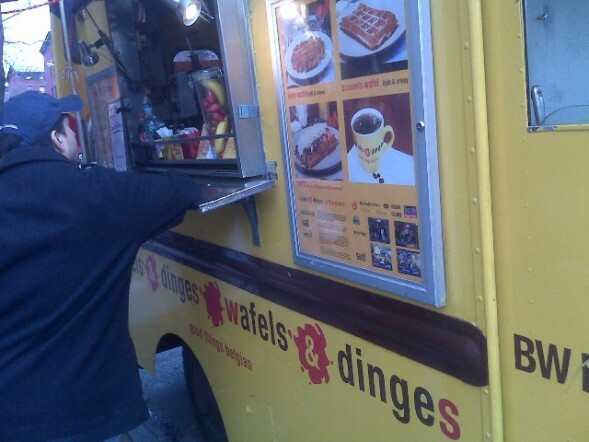 Fortunately, Wafels & Dinges seems to have found a semi-permanent home on 7th Avenue in Park Slope. I decided to start my waffle truck experience with a liege wafel with nutella, a dentist’s dream…The liege is advertised as having “sugar pearls” and it really does have nuggets of crystallized sugar throughout. Maybe a few too many. Next time, I’m opting for the Brussels Waffle. Also, here’s another nutella treat that may be of interest which I blogged about back in November, Nutella Ricotta Stuffed Pancakes. The pancakes use King Arthur unbleached white whole wheat flour and part skim ricotta which give a savoury taste that tempers the sweet decadence of nutella nicely. Translation: it won’t make you feel like your teeth are going to fall out. I’m sending all of these over to World Nutella Day, hosted by Ms. Adventures in Italy and Bleeding Espresso. *After thinking about it for a few more minutes, I realize I’ve had delicious street food, where else, but in many cities throughout India (although occasionally followed by unpleasant GI issues). Where do you get your favorite street foods? Know of a really good street cart? I would love to hear about it – click here to leave a comment below and share it. Update: Check out all of the Nutella Day entries here. wow I did not know about this…awesome looking waffle….maybe I can make something like this at home..???? since NY is so far from us. Zobars, thanks for finding me! I’ve actually never made waffles at home – it would require a waffle press at the least, and I just don’t have space to store one 🙂 If you have a hankering for nutella, try out the pancakes. Anyone have a good waffle recipe? My wife and I are always talking about going to New York. I just want to go there for the food. Forget all the sites … give me the food lol. Chuck, that’s basically us on EVERY trip we go on…we went to Florence, ate really good food and looked at the faux version of Michelangelo’s David and in Rome the Vatican was amazing but wow the pizza at Campo Di Fiori was too hahaha! Although I’m still in awe at truck food…I thought the only thing that came out of them was 50 cent, semi-bacteria laden yet tasty coffee. did u check out the recipe for nutella cookies on bakingbites website. since we are on the subject of nutella. Thanks! Those look yummy…I hadn’t visited Baking Bites before. My son Sahil is sitting next to me and he’s yelling “yummmmmmy”……and I agree!